I don't know about you, but these triple digit heatwave numbers have me craving NOT TURNING ON THE OVEN OR STOVE!! 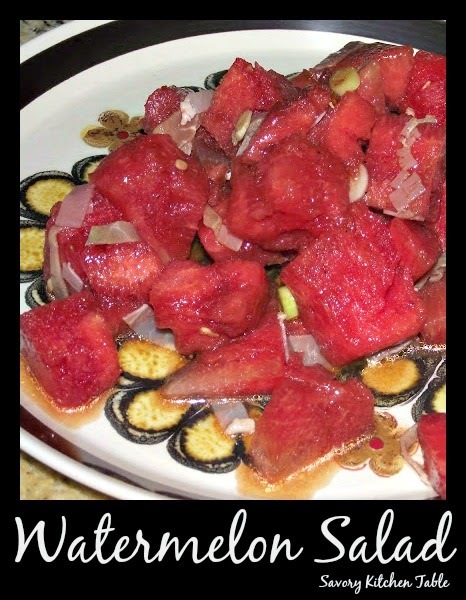 That said, this watermelon salad with prosciutto chiffonades really hit the spot tonight. chiffonade - Literally translated, this French phrase means "made of rags." Culinarily, it refers to thin strips or shreds. It usually pertains to leafy vegetables, but in this case we are cutting the prosciutto into very thin strips. In a small food processor whip together the vinegar, salt and pepper. Gradually add the oil until well blended. Pour over sald makings and toss gently.